Donnie Yen (甄子丹), Andy Lau (劉德華), Felix Wong (黃日華), Kent Tong (湯鎮業), Niki Chow (周麗淇) and the cast of film Chasing the Dragon <追龍> attended the film’s red carpet premiere in Kowloon Tong last week. 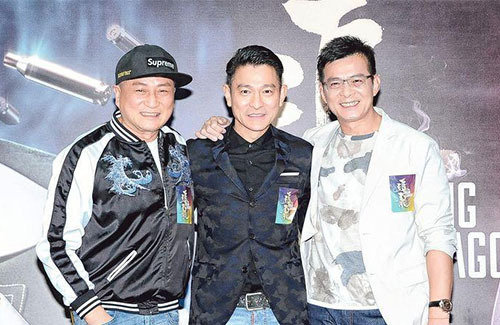 The crime film, directed by Jason Kwan (關智耀) and Wong Jing (王晶), stars Donnie Yen as the renowned criminal “Crippled Ho” Ng Shek-ho and Andy Lau as the corrupted police official Lee Rock. Ray Lui (呂良偉), who portrayed Crippled Ho in the 1991 film To Be Number One <跛豪> was at the premiere to support the film. September 27 was Andy’s 56th birthday; the cast and organizers presented Andy with a large birthday cake, coupled with flowers and birthday buns gifted by his fans. After singing Happy Birthday, Andy’s fellow tigers Felix Wong and Kent Tong gave him an embrace. Andy said his birthday wish was for Chasing the Dragon to make it big in the box office. At an earlier fan meeting, Andy shared with fans a cute video of his 5-year-old daughter Hanna Lau (劉向蕙) wiping his feet. The video was filmed soon after Andy recovered from his accident earlier this year. Chasing the Dragon opened in Hong Kong cinemas on September 28, 2017.
i would love to see Michael Miu and Felix Wong in a drama…not Kent Tong.